The 1T4 is a remote cut-off pentode suitable for use as a gain controlled RF or IF amplifier in an LF/HF receiver or transmitter. Both input and output impedances are high so to get the highest gain the anode tuned circuit should have a high Q and a high L-C ratio to get the highest dynamic resistance. The anode current was about 2.8mA. Reducing the HT supply from 90v to 67.5v shows a gain reduction of about 20%. All of the following results were obtained with a 1T4 running on a 90V supply and with no AGC applied. The measurements were made with a home made low capacitance 10:1 scope probe shown here on this site and allow for the probe capacitance of 4pF and an additional 7pF for the typical valve anode capacitance. The effect of the L/C ratio in this very low power consumption amplifier can clearly be seen in refs 1 & 2 which are an unrealistic set of values but demonstrate the point. The gain in ref 7 is a little higher than expected. Tests were also carried out using a 1L4 and a DF97 with very similar results. 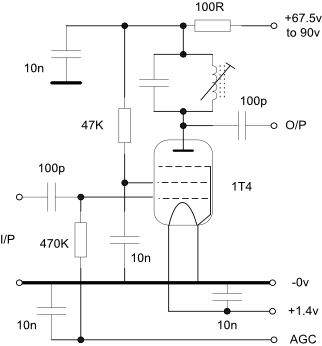 The gain of an RF amplifier in an HF bands receiver should be adequate to overcome mixer noise on the higher bands but is much less important on the lower bands where sky and man made noise predominate.